In 1989, the Philippines reeled from a shock loss to Malaysia in the South East Asian Games.This was the first and only time that the SEA Games gold medal for basketball was not won by the Philippines. And this brought the country to new depths of ignominy insofar as regional basketball was concerned. Luckily for the Philippines, also in 1989, FIBA would start allowing professionals to play in international tourneys. Thus the first all-pro national team was formed in 1990 for the Asian Games. Coached by the venerable Bobby Jaworski, this all-star team would include Allan ‘The Triggerman’ Caidic, Samboy ‘The Skywalker’ Lim, Alvin ‘The Captain’ Patrimonio, Mon ‘El Presidente’ Fernandez, Hector ‘The Director’ Calma and the newest sensation in the PBA, Benjie ‘Tower of Power’ Paras. Paras had just taken the 1989 PBA season by storm with a MVP Award on top of a Rookie of the Year award, something that has never been done before nor duplicated ever since. 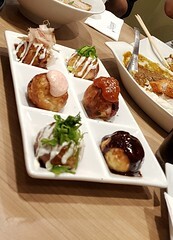 The all-pro team would provide some sort of vindication by taking home the silver medal, upending traditional rival Korea, before bowing to the eventual champs – the powerhouse Chinese team. China had the likes of Ma Jian, Shan Tao, Wang Fei and Song Li Gang, all of whom were already being scouted for possible recruitment into the NBA. Despite the obvious height discrepancy, the Jawo-inspired team fought gallantly, with Caidic and Lim being rewarded with spots in the mythical 5 selection. The start of the 90’s saw the San Miguel – Purefoods rivalry catching fire. 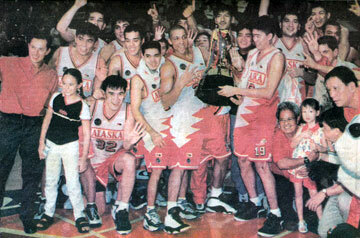 Fernandez was now at the helm of the Beermen, with former NCC players such as Calma and Lim at the forefront. 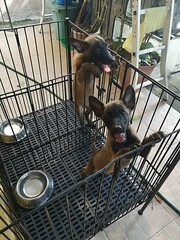 The Hotdogs, on the other hand, had Patrimonio, Jojo Lastimoso and Jerry Codinera leading a younger, equally exciting crew. But clearly, new faces were now taking over the helm of the PBA. In November 1991, Caidic fired a spectacular 79 points in a Presto-Ginebra game – most of which came from precision 3-point missiles – setting the record for the most points scored ever by a Pinoy in the PBA. The following year, in October of 1992, import Tony Harris of the Swift Mighty Meaties detonated a 105-point bomb in a game against Ginebra, setting a PBA record for most points in a game (import or local). To this date, both records have remained the standard in both categories. Other imports who provided excitement on the court were: Norman Black (who would stay and later become a fixture in PBA and Philippine Basketball), Bobby Parks (who recently died and whose son Bobby Ray Parks Jr is himself making waves in college basketball), Alaska’s consistent Sean Chambers, Kenny Redfield, and Lamont Strothers. In the mid-90s, the Alaska Milkmen would emerge as a consistent title contender in the PBA. Imbibed with a more disciplined basketball philosophy inculcated by coach Tim Cone, Alaska players Johnny Abarrientos, Purefoods transferee Jojo Lastimoso, Bong Hawkins, Jeffrey Cariaso, and Chambers would use the Lakers’ triangle offense to perfection. And this would be propel them to the last grand slam success recorded in the PBA in 1996. 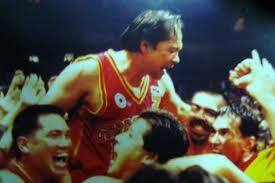 In 1997, ‘The Captain’ Patrimonio would capture his 4th MVP award, after winning it in 1991, 93, 94. This would tie him for most MVPs with his mentor-turned-rival, ‘El Presidente’ Fernandez, who had captured his 4 MVPs in the 80s. In 1998, the Centennial Team was formed. They would be led by multi-titled coach Cone, and they would capture the Jones Cup, before taking the bronze in the Asian Games in Bangkok. The line-up would include Patrimonio, Caidic, Abarrientos, Kenneth Duremdez, and Vergel Meneses. Patrimonio and Caidic would gain the distinction as the only 2 Pinoy players to have been to 4 Asian Games, starting with the 1986, 1990, 1994 to the 1998 Asiads. Also in 1998, a new league was formed to rival the PBA. The Metropolitan Basketball Association (MBA) had a similar format as the NBA, with teams representing cities or provinces. The teams would be divided into two conferences, the Northern Conference (consisting of Metro Manila and Luzon-based teams), and the Southern Conference (consisting of teams from the Visayas and Mindanao). They also had slight changes in the rules making games faster and more exciting, and the first commissioner of the fledgeling MBA was the legendary Mon Fernandez himself. These would immensely help the league gain popular support in the provinces. 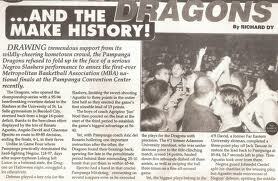 The Pampanga Dragons would be the league’s first champs. The arrival of the MBA would wreak havoc on the PBA. The draft system would be affected greatly, and this would lead to escalating player salaries as the two leagues competed to get the best talents. 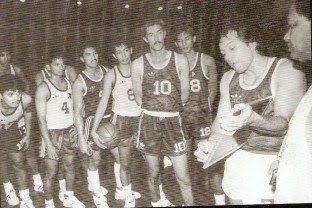 The PBA was also forced to be more aggressive with gimmicks such as the creation of the all-time mythical five selection. Named by the PBA as members of the All-Time Mythical 5 were: Caloy ‘The Big Difference’ Loyzaga (representing the 50s), Narciso Bernardo (representing the 60s), Robert ‘The Big J’ Jaworski (representing the 70s), Hector ‘The Director’ Calma (representing the 80s), and Alvin ‘The Captain’ Patrimonio (representing the 90s). Conspicuously absent in the list was Mon Fernandez, who despite his dominating 4 MVP performance in the 80s, was deliberately excluded from the list of awardees, for being the then-commissioner of the rival MBA. Robert Jaworski would finally retire from active basketball in 1998. At 52 years of age, he was – at the time of his retirement – the world’s oldest active professional basketball player. From among the players who started with the PBA, Jawo would be the last to retire, a clear manifestation of his durability as a player. His career started in the 60s as a young upstart from UE joining the amateur Crispa, then YCO team. He then moved on to Meralco, before landing in the prestigious Toyota team in the mid-70s. From the 80s to the 90s, he would go from player to playing-coach of the immensely-popular Ginebra team, inculcating a brand of underdog ball that spelled ‘never-say-die’. In 1999, we had the Fil-sham scandal. One of the PBA’s answers to the MBA threat had been the recruitment of foreign players with allegedly Pinoy blood. It was later found out however that most of these players had questionable lineage. 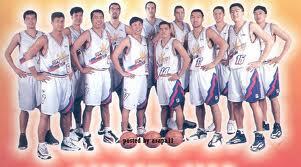 Some would somehow be able to prove their lineage and stay, such as Danny and Andy Seigle, Asi Taulava and Eric Menk. However, not a few fans abandoned the PBA as a result of the disappointing recruiting scandal. And the karma of this deliberate misrepresentation would haunt the PBA for a few years. Gate receipts would go down, lesser fans would flock the stadiums, and the number of teams would dwindle. The PBAs Best, circa 90s.. The prolific Tony Harris’ scoring record remains unbroken more than 2 decades later. 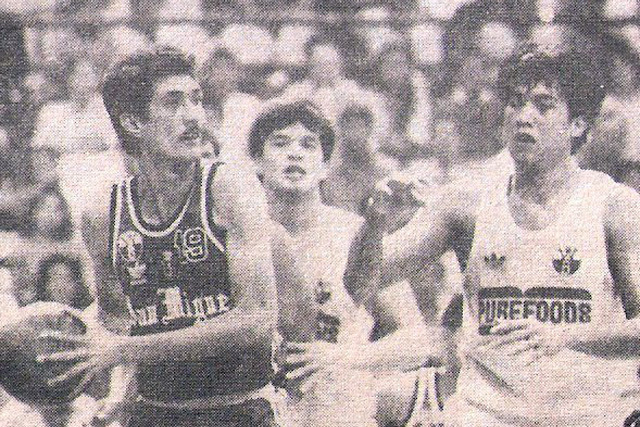 A match of scorers, Allan Caidic vs Vergel Meneses. Sir where is part 7? my apologies, sir. i have been kept busy with other concerns that i have not had time for the needed research for our ongoing saga. some slack please. The 90’s saw the ‘changing of the guards’, as the PBA’s – and the country’s – top cagers started to bow out to the next generation stars. As the likes of Bobby Jaworski, Mon Fernandez and Abet Guidaben started huffing and puffing, a fresh group of stars were lining up at the officials’ table, ready to substitute for the stars. Alvin Patrimonio, Allan Caidic, Samboy Lim, Hec Calma, Benjie Paras, Jojo Lastimosa. These were just some of the names that would enthrall the new basketball fandom. Oh yes, as new players paraded in the hardcourt, a new breed of fans would also fill the rafters and crowd the family TV sets.